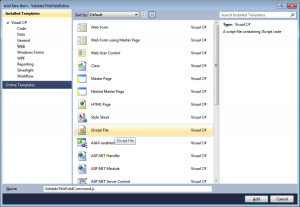 Let’s start by creating a Visual Studio Project for our requirements. I tend to start with an Empty Solution, then add the the “Editor” project. In the next part of this tutorial we will also use a “Model” project but not in this tutorial. 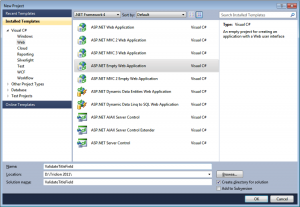 (note that I use the project type “ASP.NET Empty Web Application”). Delete the first project that Visual Studio always creates. 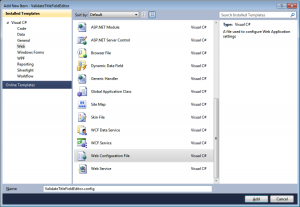 Again, use the “Empty ASP.NET solution” template. Under commands, let’s create a file named “ValidateTitleFieldCommand.js” – Visual Studio seems to believe people still use Jscript, let’s not get bothered by it. Under Config create a file named “ValidateTitleFieldEditor.config”. This will be used to configure our GUI Extension to ‘listen’ to the Save events. 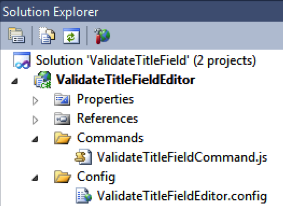 Here we will add the configuration to the ValidateTitleFieldEditor.config and much of it will not make any sense. Please follow along and we will be at the fun part in no time. 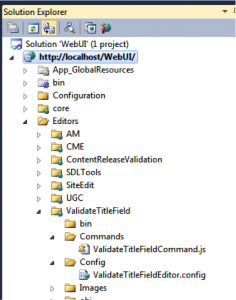 Open the Configuration ValidateTitleFieldEditor.js file. If you haven’t learned how to yet, make sure you add the Tridion Schemas to this editor. Right click anywhere on the config file, select properties. What are we doing in this configuration? The group is a “CommandSet” and we’re basically telling Tridion to treat these files as a group, and that the files have dependencies on other Tridion items. And within this, we’re extending the “Save” Command with our own CommandSet. Note: This is where we wire up to the Save, Save and Close, and Save and New commands. That “implementation” attribute is the name of the Anguilla Class that we will use to implement the command. 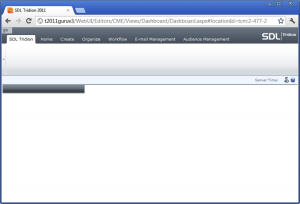 Let’s add our extension as a Virtual Directory to the CME’s “Editors” folder. I tend to point these directly to my development folder so that all code changes are immediate. As you can see in the screenshot, the physical path should match the start of your “Editor” project. 1. Make a backup copy of this file, and edit it with a proper XML Editor (like Visual Studio). 2. Find the Element named “<editors default=”CME”>” (around line 1000 in my system.config). 4. 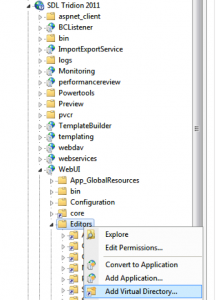 Restart IIS (iisreset) and reload the Tridion Content Manager Explorer. Let’s create our Command. Open the “ValidateTitleFieldCommand.js” file. This implements the _isAvailable, _isEnabled, and _execute functions required for every command. As you can see, all we’re doing is logging that the code was invoked (so we can verify it was loaded) and telling Tridion to go ahead and execute the “Save” Command. The console.debug statement will write the output the the Firebug Console window or Console window in the Chrome Developer Tools. We should now have enough to register this (Editor) extension with Tridion. 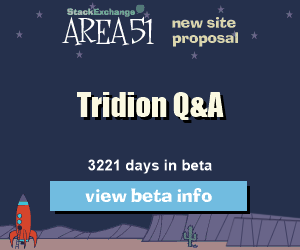 To do this, we need to tell Tridion that we are an extension, and where the configuration for the extension is. How do I know it’s working? In this case, the error is caused because my Editor configuration in System.Config points to a vdir named “ValidateTitleFieldEditor” but the Virtual Directory in IIS is called “ValidateTitleField”. Changing the configuration to specify the correct vdir will fix the issue. If you had a different issue, chances are that opening this url in a browser will give you concrete error messages that should guide you into fixing your problem. If you were paying attention to any of this, you should know how to test if your command is being called. If you weren’t, here’s how. We added a “console.debug” instruction to all those functions. This confirms our command is being called and our GUI Extension is working. Now let’s tell our users about their mistake with a popup. In the popup we will show them a message that the title field needs to start with a Captial letter. This involves using the Anguilla API to inspect the field’s value when the Save, Save and Close, or Save and New button. 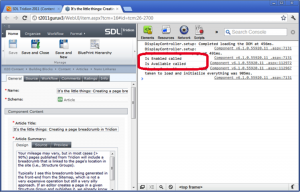 Select “Local IIS” on the left side, then search for the “SDL Tridion 2011” website, expand it and select “WebUI”. Now that we’re here, we’re going to try reading the current value of the “Title” field in the component you’re trying to save. So, just like with any other Tridion Extension, the first thing we’ll do is make sure we should be executing _at all_. Value of this field does not start with an Uppercase letter. Also, notice the return statement where we allow the GUI to continue saving. Which would result in something like this showing up to your editors. We did it! Congratulations for making it this far! While stepping through code I can also go to the Console Window and see the other methods and properties that are available for these objects. The Tridion 2011 Anguilla Framework gives us the opportunity to provide friendlier feedback to the user and also increase the quality of content entered into Tridion by enforcing editorial guidelines. We’ve used the Anguilla Framework to access the fieldBuilder object in the Tridion GUI and inspect the field contents, showing a warning if they do not meet our requirements. In the next post we’ll update the popup and allow users to make changes to the content in the popup window itself. Thanks again to Nuno for creating this awesome post. I was playing the other day with creating Schemas programmatically and I noticed there is this Pattern property on a SingleLineTextFieldDefinition, which allows you to specify a regular expression pattern. Only values matching that expression would be allowed (otherwise you cannot save the item using that Schema). The same logic can be achieved specifying the pattern directly in the Schema XSD (manually). My question is: why wouldn’t you use this OOTB mechanism? Thanks for the great suggestion. Yes, it is a cleaner and easier solution to edit the XSD source and insert a regular expression to validate the field. In the past the error message window did not provide good enough feedback to the user and sometimes the message was nested in a long error message. I have not yet tried this in 2011 but will do so and update the post if it is a clear and friendly error message. For more complicated business rules, such as if the Country is US then the State field must be filled in – but the State field is optional in the Schema, this solution works well and the RegEx would not be able to validate this more complicated solution. Thanks again for the good feedback! The troubleshooting tips are a nice touch. What should we call that empty GUI error that I’m sure we’ve all seen? It is clear to understand that we are overriding the functionality of Save & Close and Save & New but how can we achieve the same functionality for save & close and save & new. We have added Save and close and Save and New to our configuration file. 2. If we have made some changes in a component and wishes to check-in then it prompts for saving the component. Using above extension it allows to save the component without checking the component Title first character. Do we need to add check-in too in our config file. The 2018 Tridion Developer Summit will take place on 6-7 September in Amsterdam. Thank you for your interest in Tridion and I hope this website and articles help you solve your problems and create successful solutions.